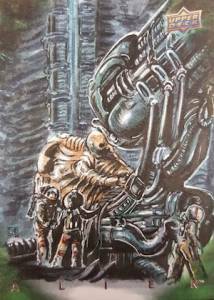 An iconic film in the world of science fiction, 2017 Upper Deck Alien brings back the scary good debut for an updated cardboard take. In this instance, old-school designs are joined by modern hits, which fall two per box. 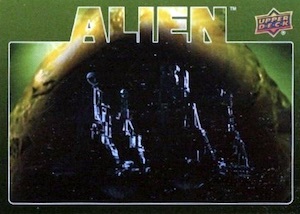 Of course, this is not the first set to detail the original movie, as 1979 Topps Alien gave collectors their earliest taste of Alien trading cards. 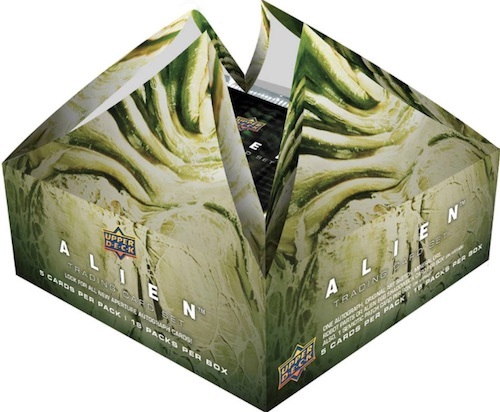 Also, UD previously offered an overall look at the franchise with 2016 Upper Deck Alien Anthology. 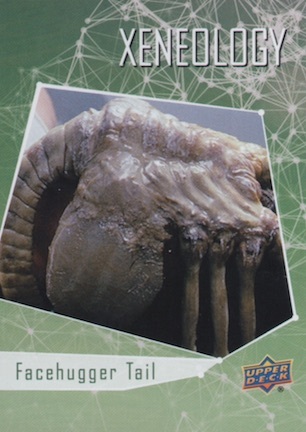 Going retro in honor of the 1979 film, the 2017 Upper Deck Alien base set features 100 cards highlighting movie footage. The "retro" aspect comes into play for both the design and the card stock. Applying a more current component of the hobby, parallels include Silver Foil, Blue Foil (#/99), Red Foil (#/25) and Canvas (#/15). 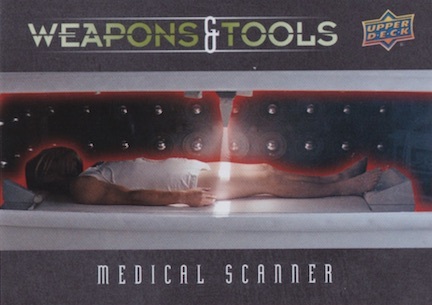 There are also one-of-one Printing Plate cards that were used in the production of the set. 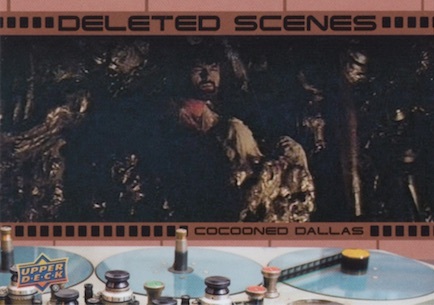 Consisting of seven different options, the inserts offer background details such as behind the scenes information and deleted scenes. 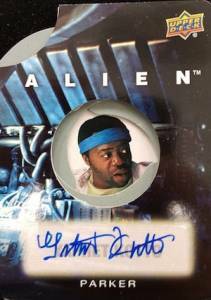 Providing a diverse supply of premium hits, the 2017 Upper Deck Alien checklist features authentic signatures as well as a variety of relics. 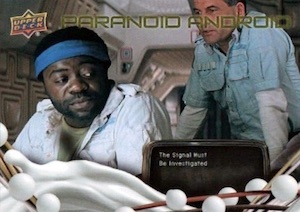 Each box delivers one manufactured Semiotic Patch, which highlights the symbols used to note specific items in the film. All other hits combine to represent the second premium pull in each box. These include hobby staples like actor Autographs and hand-drawn Sketch cards. 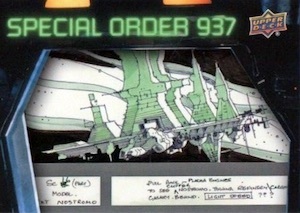 The more unique choices consist of Robot Parts, which is a manufactured relic set based around Ash, the robotic crew member on the Nostromo. Meanwhile, Mineral Ore offers actual pieces of mined rock. 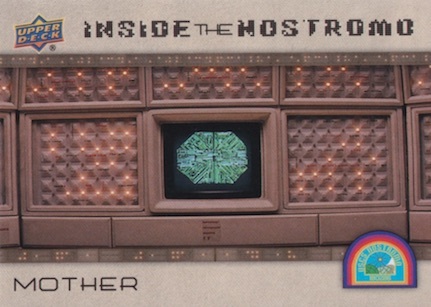 Most likely to elicit a squeal of delight (or terror), the Alien Egg Shadow Box cards have something waiting inside. Odds noted below for Hobby (h) and ePack (e) as applicable. RETRO PARALLELS: Canvas #/15, Printing Plates #/4. MODERN PARALLELS: Silver Foil (1:1 h/e), Blue Foil #/99, Red Foil #/25, Printing Plates #/4. 7 cards. Shop autographs on eBay. Overall odds: 1:48 hobby/ePack. Individual group odds listed below. Overall odds: 1:180 hobby/ePack. Individual group odds listed below. Overall odds: 1:432 hobby/ePack. Individual group odds listed below. 7 cards. Serial numbered #/50. 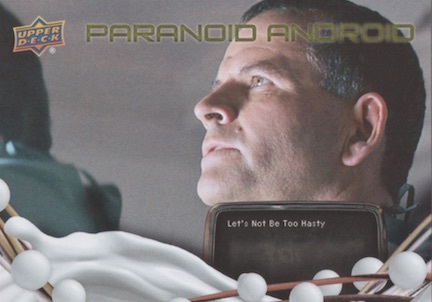 PARALLEL CARDS: Printing Plates #/4 (#HID2 - 1/1). PARALLEL CARDS: Printing Plates #/4 (#S08,S09 - 1/1). 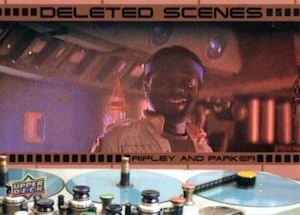 Good: Some very innovative hits; Sigourney Weaver autographs; deep coverage of the film. 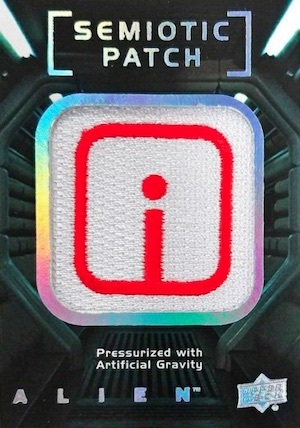 Bad: Standard inserts feel a little bland; higher price point for two hits when one is a manufactured patch. 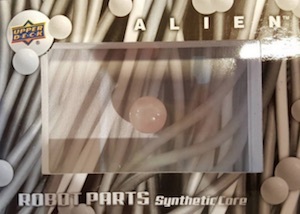 The Bottom Line: Although it revisits a 1979 movie, 2017 Upper Deck Alien does an admirable job mixing retro and modern aspects in the set. Focusing on just the first film, the signer list is a bit sparse, and the box price might be a tad high, but it's a pretty cool entertainment release. Offering most of the old-school look and feel, the base set is decidedly retro. I like it. Some of the images from the film are grainy, but that is easy to understand given the age of the film. While I have no real issue with the "modern" parallels that add a bulky, foil-accented frame to the base design, along with a glossy finish, I would have preferred an Alien Green foil instead of the Red or Blue, which clashes (to my eyes). 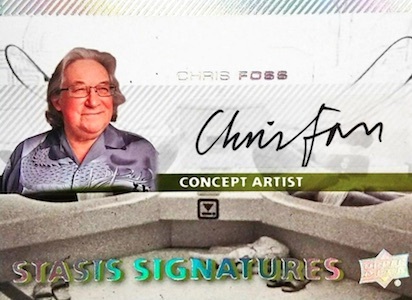 Although the autograph cards would have been better hard-signed, the main Stasis Signatures design is solid if not overly memorable. On the other hand, the Aperture cards are quite interesting, with a design that allows collectors to either expose or hide the image of the signer, which is set inside a small circle. 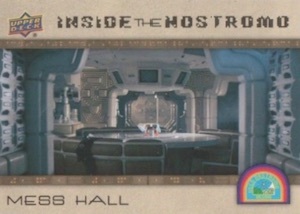 I never got to see one in action myself, but the Alien Egg Shadow is another example of an effort to be unique, as the card can be "opened." 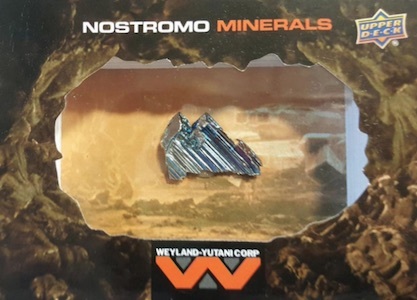 Using the same basic design with a thick card and large cut-out viewing area, Nostromo Minerals has actual pieces of bismuth, calcium or cobalt, while Robot Parts contains manufactured pieces. 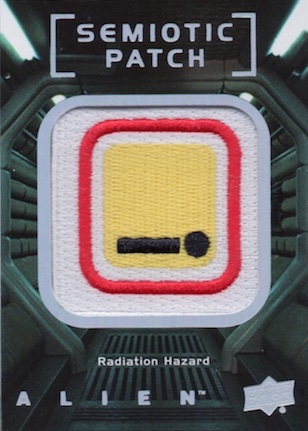 I don't personally care for commemorative relics as a standard card element, but I did think the Semiotic Patch set was a clever way to utilize an aspect of the film that many might overlook. It also felt more cohesive that just a few random alien patches. Perhaps due to the creativity used for the hit cards, I felt the seven standard inserts needed a little more in the design department. The only one to really catch my attention was Xeneology, which used the green exterior background to frame the alien image. 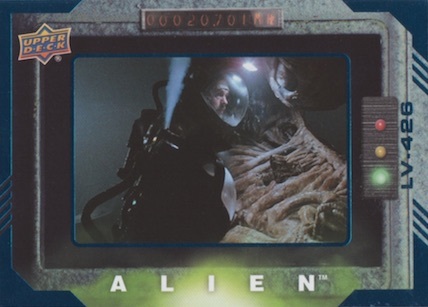 With the 100-card base set, and an assortment of inserts, the main 2017 Upper Deck Alien Movie checklist is fairly manageable for set collectors. The base set will take at least two boxes to complete, and although the inserts only come a few per box, the set sizes are all on the smaller side. The other checklist of note is for the signers. 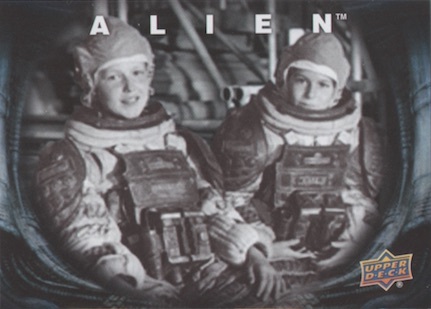 All things considered, 2017 UD Alien hits most of the key names, including Tom Skerritt as Dallas, Ian Holm as Ash, Veronica Cartwright as Lambert, Yaphet Kotto as Parker, and Sigourney Weaver as Ripley. While this is great, the movie has a very limited main cast and collectors won't likely be as excited for a writer or concept artist signature. 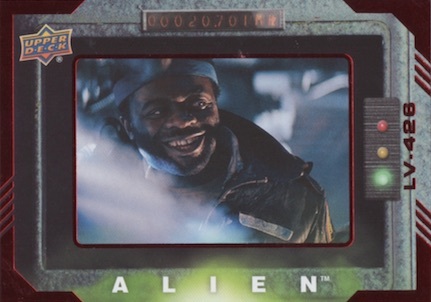 Yaphet Kotto is the only new cast signer for 2017, but, to be fair, all of the other main actors from the film are now deceased. 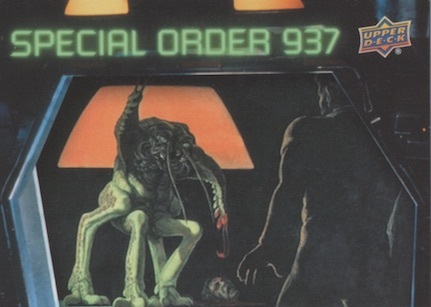 Director Ridley Scott would have been a nice addition here, though. Priced at about $120-130 per box at the time of this review, the value output can struggle when you know one hit is going to be a Semiotic Patch. 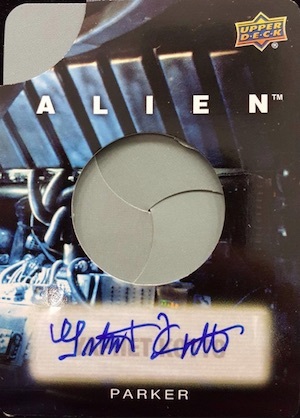 Also hurting the value is the fact that another UD Alien set came out in 2016, with nearly all the same signers, plus several from other films in the franchise. 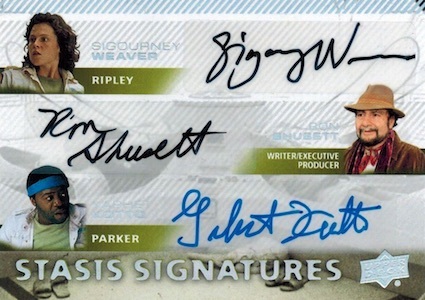 On the plus side for value are Sigourney Weaver autographs and the multi-subject cast signatures. 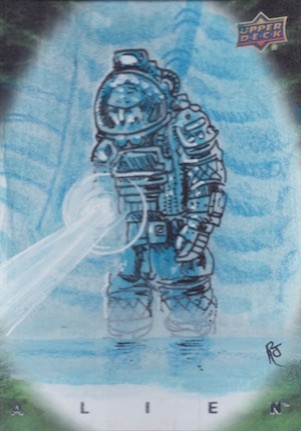 There are also the quality sketch cards and Nostromo Minerals redemptions. 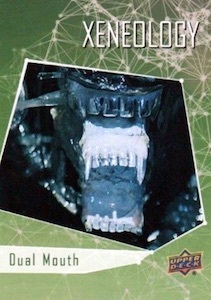 2017 Upper Deck Alien Movie is a fun set because you can really see that UD put in some effort to be distinct. Even the box itself adds to the enjoyment as it mimics an Ovomorph egg that opens to reveal the packs. It was all these little details and the various design elements that really stood out to me, and I found it to be a very exciting break. 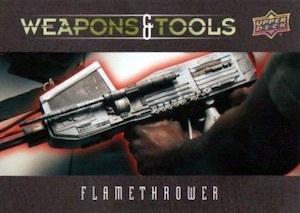 The box used for this review was provided by Upper Deck Entertainment.